In 1895, the New Jersey State Legislature formally established the New Jersey State Museum in the capital city of Trenton with a mission to collect and exhibit specimens in natural history, archaeology, and industrial history. Original collections included natural history specimens amassed in the 19th century. 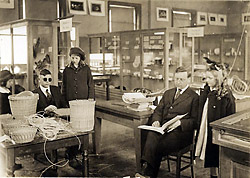 Between 1900 and 1912, the State Museum strengthened its archaeology focus by initiating a field research program. It adopted a statewide Education Extension Service in 1914 that lent models, lantern slides, and specimens to schools throughout the state. 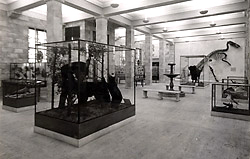 In 1929 expanded space in the newly-constructed State House Annex permitted extensive exhibitions of the natural history and New Jersey prehistory collections. Decorative arts became a third collection field at this time when the State Museum expanded its focus beyond industrial history to include the manufacture of ceramics. The ethnographic collection was initiated in 1932 when the State Museum purchased part of an exhibition of North American Indian art. The collection was strengthened in the 1940s when noted anthropologist Frank Speck made field collections for the State Museum among the Delaware Indians of Oklahoma and Canada. Exhibitions of these artifacts attracted the interest of New Jersey residents whose donations from private collections built the collection in the ensuing years.Growing interest in education and culture in the late 1950s resulted in the construction of a modern cultural complex near the State House that opened in 1965 and included a four-level Museum building, an adjoining planetarium, and an adjacent auditorium. 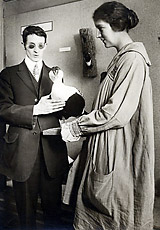 At that time, fine art became the Museum's fourth collection area. The State Museum was initially accredited by the American Alliance of Museums in 1974. Since 1983 it has been a division of the New Jersey Department of State. Museum is founded with Natural History specimens collected since the early 1800s. Archaeology is added as second collection area. Ethnology becomes a partner with Archaeology when Museum purchases North American Indian art. Decorative Arts is added as third collection area. Fine Art becomes fourth area of collecting. Museum moves to new Cultural Complex. Friends (501)(c)(3) support group established. 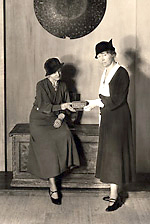 Museum is initially accredited by the AAM. Museum becomes a Division of the NJ Department of State. The Foundation has received an operating support grant from the New Jersey Historical Commission, a division of the Department of State.